Personalized Established Year House Sign - - western red cedar house plaque for your home or camp. Red Cedar construction custom designed and etched. Personalized with the name and Est. year you supply. Two sizes: 11x11 and 11x14. Three design options: floral (large image), square (small image on left), and swirls (small image on right). Protective coating helps protect against the weather. 1" thick wood helps prevent warping. Two lines of personalization with up to eighteen (18) characters per line and the year the house was built or the family was established. Character size varies depending on count. Wall-mount using the saw-tooth bracket on back of sign. Custom designs: four corners, angular, floral vine, and log cabin. 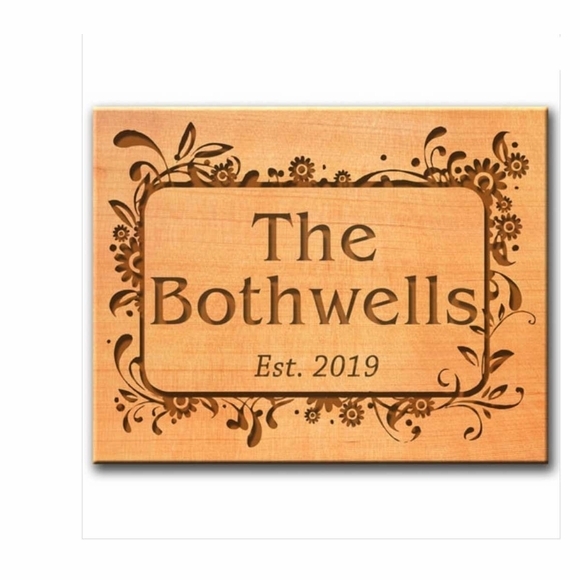 Western red cedar Established Year House Sign with etched wording and accent design.